Playing cards are believed to have been invented in Ancient India. They were found in China as early as the 9th century during the Tang Dynasty (618–907), when relatives of a princess played a "leaf game". The Tang writer Su E (obtained a jinshi degree in 885) stated that Princess Tongchang (?–870), daughter of Emperor Yizong of Tang (r. 860–874), played the leaf game with members of the Wei clan to pass the time. The Song Dynasty (960–1279) scholar Ouyang Xiu (1007–1072) asserted that card games existed since the mid Tang Dynasty and associated their invention with the simultaneous development of using sheets or pages instead of paper rolls as a writing medium. A book on cards called Yezi Gexi was allegedly written by a Tang era woman, and was commented on by Chinese writers of subsequent dynasties. Ancient Chinese "money cards" have four "suits": coins (or cash), strings of coins (which may have been misinterpreted as sticks from crude drawings), myriads (of coins or of strings), and tens of myriads (where a myriad is 10000). These were represented by ideograms, with numerals of 2–9 in the first three suits and numerals 1–9 in the "tens of myriads". Wilkinson suggests that the first cards may have been actual paper currency which were both the tools of gaming and the stakes being played for, as in trading card games. The designs on modern Mahjong tiles likely evolved from those earliest playing cards. However, it may be that the first deck of cards ever printed was a Chinese domino deck, in whose cards we can see all the 21 combinations of a pair of dice. In Kuei-t'ien-lu, a Chinese text redacted in the 11th century, we find that dominoes cards were printed during the Tang Dynasty, contemporary to the first printed books. The Chinese word pái (?) is used to describe both paper cards and gaming tiles. Playing cards, originally derived from India were introduced into Europe by the Saracens. They are noticed in Europe as early as 1275, and were known in England before 1464. Rudolph I of Germany is said to have amused himself with playing cards, and are mentioned in German works between the years 1286 and 1384. The 38th canon of the council of Worcester (1240) is often quoted as evidence of cards having been known in England in the middle of the 13th century, but the games de rege et regina (concerning the king and the queen) there mentioned are now thought to more likely have been chess. The background of an 11th century textile appears to feature hearts, clubs, diamonds and spades. It is known as “Bishop Gunther’s shroud” made in Constantinople, and now in Bamberg Cathedral. If cards were generally known in Europe as early as 1278, it is very remarkable that Petrarch, in his work De remediis utriusque fortunae (On the remedies of good/bad fortunes) that treats gaming, never once mentions them. A miniature of courtiers playing cards with the king can be found in the Roman du Roy Meliadus de Leonnoys (c. 1352), produced for King Louis II of Naples. Playing cards first entered Europe in the late 14th century, probably from Mamluk Egypt, with suits very similar to the tarot suits of Swords, Staves, Cups and Coins (also known as disks, and pentacles) and those still used in traditional Italian, Spanish and Portuguese decks. The first documentary evidence is a ban on their use in 1367, Bern, Switzerland. Wide use of playing cards in Europe can, with some certainty, be traced from 1377 onwards. The Mameluke deck contained 52 cards comprising four "suits": polo sticks, coins, swords, and cups. Each suit contained ten "spot" cards (cards identified by the number of suit symbols or "pips" they show) and three "court" cards named malik (King), na'ib malik (Viceroy or Deputy King), and thani na'ib (Second or Under-Deputy). The Mameluke court cards showed abstract designs not depicting persons (at least not in any surviving specimens) though they did bear the names of military officers. A complete pack of Mameluke playing cards was discovered by Leo Mayer in the Topkapi Palace, Istanbul, in 1939; this particular complete pack was not made before 1400, but the complete deck allowed matching to a private fragment dated to the 12th or 13th century. In effect it is not a complete deck, but there are cards of three packs of the same style. It is not known whether these cards influenced the design of the Indian cards used for the game of Ganjifa, or whether the Indian cards may have influenced these. 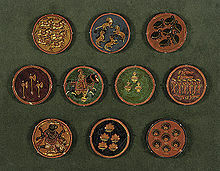 Regardless, the Indian cards have many distinctive features: they are round, generally hand painted with intricate designs, and comprise more than four suits (often as many as thirty two, like a deck in the Deutsches Spielkarten-Museum, painted in the Mewar, a city in Rajasthan, between the 18th and 19th century. Decks used to play have from eight up to twenty suits). 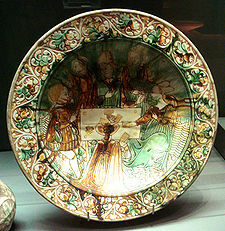 Italians playing cards, Sancai-type bowl, Northern Italy, mid-15th century. In the late 14th century, the use of playing cards spread rapidly throughout Europe. Documents mentioning cards date from 1371 in Spain, 1377 in Switzerland, and 1380 in many locations including Florence and Paris. A 1369 Paris ordinance [on gaming?] does not mention cards, but its 1377 update does. In the account books of Johanna, duchess of Brabant and Wenceslaus I, duke of Luxemburg, an entry dated May 14, 1379, reads: "Given to Monsieur and Madame four peters, two forms, value eight and a half moutons, wherewith to buy a pack of cards". In his book of accounts for 1392 or 1393, Charles or Charbot Poupart, treasurer of the household of Charles VI of France, records payment for the painting of three sets of cards. The earliest cards were made by hand, like those designed for Charles VI; this was expensive. Printed woodcut decks appeared in the 15th century. The technique of printing woodcuts to decorate fabric was transferred to printing on paper around 1400 in Christian Europe, very shortly after the first recorded manufacture of paper there, while in Islamic Spain it was much older. The earliest dated European woodcut is 1418. No examples of printed cards from before 1423 survive. But from about 1418 to 1450 professional card makers in Ulm, Nuremberg, and Augsburg created printed decks. Playing cards even competed with devotional images as the most common uses for woodcut in this period. Most early woodcuts of all types were coloured after printing, either by hand or, from about 1450 onwards, stencils. These 15th century playing cards were probably painted. The Master of the Playing Cards worked in Germany from the 1430s with the newly invented printmaking technique of engraving. Several other important engravers also made cards, including Master ES and Martin Schongauer. Engraving was much more expensive than woodcut, and engraved cards must have been relatively unusual. In the 15th century in Europe, the suits of playing cards varied; typically a deck had four suits, although five suits were common and other structures are also known. In Germany, hearts (Herz/Dolle/Rot), bells (Schall), leaves (Grün), and acorns (Eichel) became the standard suits and are still used in Eastern and Southeastern German decks today for Skat, Schafkopf, Doppelkopf, and other games. Italian and Spanish cards of the 15th century used swords, batons (or wands), cups, and coins (or rings). The Tarot, which included extra trump cards, was invented in Italy in the 15th century. The four suits now used in most of the world — spades, hearts, diamonds, and clubs — originated in France in approximately 1480. The trèfle (club) was probably copied from the acorn and the pique (spade) from the leaf of the German suits. The names "pique" and "spade", however, may have derived from the sword of the Italian suits. In England, the French suits were eventually used, although the earliest decks had the Italian suits [Chatto, link not provided]. Also in the 15th century, Europeans changed the court cards to represent European royalty and attendants, originally "king", "chevalier" (knight), and "knave" (or "servant"). In a German pack from the 1440s, Queens replace Kings in two of the suits as the highest card. Fifty-six-card decks containing a King, Queen, Knight, and Valet (from the French tarot court) were common.